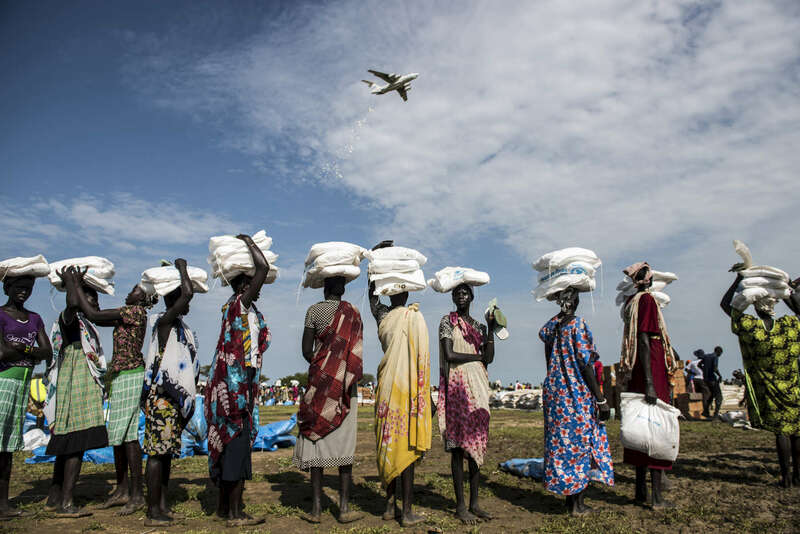 Planes with the World Food Program conduct food drops to help aid new internally displaced Southern Sudanese, who were recently displaced from Leer, Mayangi, and Koch to the area of Nyal, in Unity State, South Sudan, September 10, 2015. Because of ongoing fighting throughout South Sudan, civilians have been unable to till their land and plant crops, and aid organisations have been unable to deliver food. In a rare window of peace in the area, WFP has been dropping TK tons of food in Nyal for locals and surrounding villages. Chuol, 9, from southern Unity State or outside Leer, lives within a host community full of local villagers and other internally displaced with his grandmother and sister. several months ago, his own village was attacked, and his father and grandfather were burned alive. He, his grandmother, and sister fled to this area, where they are living on the ground of a host family.